The metro (subway) is a fast and easy way to travel when visiting Rome but it is best suited outside the central parts in Rome. But you can use the metro to get to the main attractions like the Spanish Steps and the Colosseum and you also get close to the St. Peters Basilica for example. 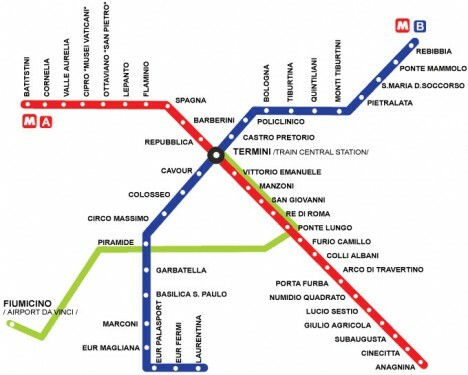 There are to to main metro lines and they both intersect at Termini, the train central that acts as a transport hub in Rome where the metro, trains and busses meets. Use the Rome Metro Map below to get an overview of the different locations of the Metro stations on the map in Rome. You can buy your Metro tickets in automated ticket machines and in tobacconist. Click on the Rome Metro Map for a larger version! Have been looking for a Rome Metro Map. Do you perhaps have a train map also?